Days after warnings about the tinder-dry nature of much of the landscape a series of blazes burst into life. One of the biggest took hold in Sutherland on Saturday, where crews battled for more than 20 hours to contain the flames. It led to a public appeal from fire chiefs keen to ask for extra vigilance amidst the dry spell and ensure that unthinking acts do not lead to further incidents. They continued on Sunday, when four crews tackled a four-mile fire front on open land on Skye. 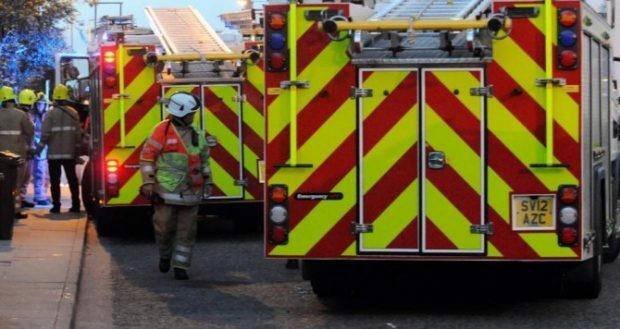 The wildfire took hold at 8.45am, around five miles from Portree, with firefighters from Portree, Kyle and Lochcarron joined by a rapid response unit from Staffin. Police were forced to close the important B855 route as a safety precaution to allow the crews to control and extinguish the blaze. The B855 links Struan on the north-west of the island with Portree. As a result of its closure, motorists faced diversions of around 30 miles around the north end or the slightly shorter route of 23 miles via Sligachan in order to gain access to Struan. Elsewhere, a fire in the open on Orkney sent dark clouds of smoke – visibile for many miles around – billowing into the airs. The fire on Puldrite Road demanded the attention of two crews from Stromness, with an additional appliance from Kirkwall soon tasked to help. A local farmer also assisted by providing use of his slurry tankers. In another incident, crews also battled hard yesterday to ensure wildfire did not threaten a nearby home off the A832 at Dundonnel. The crews, two from Dingwall and one from Beauly, used beaters to protect the plantation property after a 999 call at 3.14pm. Area Manager Bruce Farquharson, who is also the chair of the Scottish Wildfire Forum, said: “We saw last year the devastating effect wildfires can have on communities and wildlife. “Wildfires are a major threat to our wildlife and wild places. “We encourage people visiting the outdoors to be extra careful and check the advice in the Scottish Outdoor Access Code before starting a fire.